President Trump on Thursday announced a major semiconductor company will be relocating to the United States. 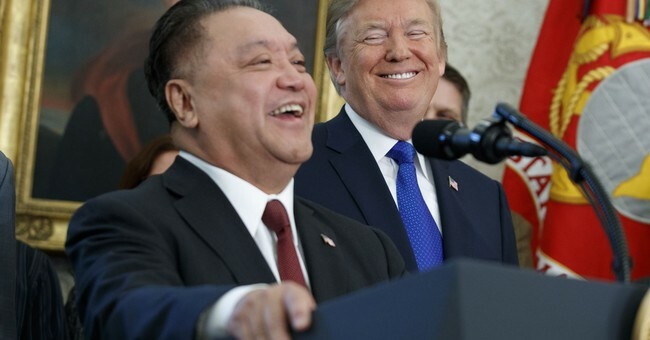 The $100 billion Broadcom Limited, currently located in Singapore, is moving to Delaware once shareholders approve, bringing $20 billion in annual revenue back to the United States. The company, which manufactures communications chips worldwide, said the GOP’s business-friendly tax plan will make the U.S. easier to do business in. "America is once again the best place to lead a business with a global footprint," Broadcom CEO Hock Tan said, reports the AP. "The proposed tax reform package would level the global playing field and allow us to compete worldwide from here in the United States," he added. "Our move would domicile our $20 billion annual revenue in the United States. From our base here, each year we will invest $3 billion in research and engineering and $6 billion in manufacturing, resulting in more high-paying tech jobs." Broadcom's move to the U.S. will take place regardless of whether the Republican plan passes, the company said. A year ago the company entered a $5.5 billion agreement to merge with U.S. network provider Brocade Communications Systems, but that has been delayed while it's scrutinized by the Committee on Foreign Investment in the United States. The high-level government committee, familiarly known as CFIUS, investigates proposed acquisitions of U.S. companies by foreign buyers on national security and intellectual property grounds. By becoming a U.S.-based company, Broadcom would avoid the CFIUS process. The company makes semiconductor chips used for a variety of products, from cable set-top boxes to smartphones and other wireless devices. Broadcom’s headquarters are currently in San Jose, California, and will stay there. The company also has 7,500 American employees in 24 states across the U.S.